It was 1943 when French philosopher, activist and provocateur Simone Weil penned these words in a missive to her parents from a sanitarium where she was slowly dying from an onset of various debilitating ailments including tuberculosis. These would be some of her final words; Weil passed away shortly after dispatching the letter. She was 34. I have respectfully and perhaps in some ways naively attempted in this long-running 10-part “On The Fringe”series of mine to showcase works of American cinema from around the time of Weil’s death (or what we can consider to be the “modern era” of the artform) until now that boldly focus on the varied and unsparing experiences of those in our nation who tend to be far too “under the radar” in the eyes of the mainstream media/entertainment industries to have their milieu broadcast on the silver (and small) screen. With Weil’s words in mind and as an underlying theme of this series, I am delighted to be able to wrap things up with nascent cinematic truth-teller Sean Baker and his breakout masterwork Tangerine. I’m not the first to note that Baker’s film was itself left “under the radar” in the year of its release. Perhaps due to the often typical vicissitudes of marketing confusion/pusillanimity for such modest projects, Tangerine became lost in a foggy shuffle between “that movie that was shot entirely on an iPhone” and what appeared from the first trailers and promotion to be yet another quirky but garden variety urban comedy about LA. 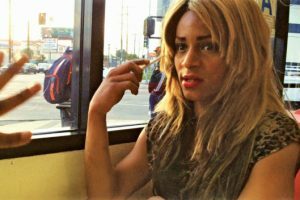 Was Tangerine a light-weight Friday knockoff involving the day-in-the-life misadventures of stereotypical habitués in the hood? Or was it some kind of Dogme 95-inspired art film punctuated by pioneering mobile phone technology? This tepid promotional strategy verging on brinkmanship made for an unfortunate combination, as the audience for the former pitch would likely be (and were likely) alienate(d) by the latter pitch, and vice versa. As critics, filmmakers and general audience members began spreading the word of the profound impact Tangerine was having on them after – you know – actually seeing the thing, the real story came out: the film is blissfully (and again unfortunately for our current marketing/media/promotional arenas) unclassifiable. If there is any direct predecessor for Tangerine, it would have to be Charles Burnett’s 1978 film Killer of Sheep, discussed at length early on in my “On The Fringe” series as one of the most significant American films to truthfully spotlight an otherwise largely elided community, with courageously spartan, unvarnished objectivity. As previously noted, Baker would in fact be one of the apropos presenters of Burnett’s honorary Oscar this past year, explaining how much of what he tried to do with Tangerine and his continued work (including the must-watch short film “Snowbird” and his recently acclaimed, admirable but slightly etiolated The Florida Project) was and is based in his attempt to emulate Burnett’s own DIY praxis and unmitigated, extemporaneous sincerity a la Killer of Sheep. Indeed, Tangerine, like its spiritual antecedent, presents an awesomely kaleidoscopic view of the Los Angeles we are so rarely privy to seeing even today on the small and large screens alike. As with Killer of Sheep, Tangerine is less a genre-bender than it is a film that explodes genre altogether. In being as wryly earnest as possible – helped, no doubt, by that technological utility of having been shot on a mobile phone, allowing for the breezily improvisational and cinéma vérité style with which its since become, for good or ill, synonymous – Tangerine has equal measure of laughs as tears (with moments, as with Killer of Sheep, that could easily have been included in some of Charlie Chaplin’s similar comedy of errors pictures tinged with real-world pathos), equal triumphs and tragedy, with – as hypocritically cliché as it sounds – everything in between. The plot rocket-launches into intense high-gear (punctuated by a throbbing electronic score) when black, transgender streetwalker Sin-Dee (as in “Sin-Dee Rella”) is released from a 28-day stint in jail for drug possession. What follows is an effulgently, sometimes blindingly bright Christmas Eve day (and, later, evening) that unfolds with Sin-Dee meeting up with her best friend and fellow transgender prostitute Alexandra. Alexandra accidentally lets the cat out of the bag that Sin-Dee’s beloved boyfriend/fiancée Chester (who turns out to be a bisexual, tatted-up, drug-dealing white boy making his office out of a Cambodian-owned donut shop in a generic mini-mall cul-de-sac) has cheated on her while she was locked up, setting Sin-Dee off on a mission to find the girl who caused her such undue heartache. As the film progresses, so too does our widening scope of the interweaving, labyrinthine, seemingly endless sidewalks and streets of that section of LA just south of touristy Hollywood, just west of hipstery Los Feliz/Silver Lake and just east of the decadent so-called three-mile-zone (cough cough “TMZ”) of Sunset Blvd. We follow multiple characters, Robert Altman-style, through the rest of the day, be they Sin-Dee; Alexandra (whose own mission is to gather as many friends and well-wishers as possible to come to a small performance of her singing that night at a well-known hamburger/cocktail lounge in West Hollywood); Chester; the sickly-pale, emaciated meth-head whore (with only one shoe) Dinah that Sin-Dee finds and drags around with her by the stringy hair to confront her cheating boyfriend; and even the young Cambodian woman at Chester’s donut shop who just wants everyone to calm down before she calls the police because she’s “running a business” as she cries out over and over again (despite our never seeing a single customer in the store that is more of a front for Chester’s various underbelly dealings, comically framed by the generically bland, nearly domestic locale). We’re privy too to a roving camera not only through the small galaxy of characters milling around their confined square of the LA universe (breathtakingly observed through the inconspicuous iPhone camerawork that allowed Baker and his ragtag crew to follow behind Sin-Dee and others onto busses, walking through crowds on Hollywood Blvd. etc. almost as though through “stolen” spy camera footage), but also through the one character (and what ends up being his family, including a rather enraged mother-in-law) who appears the unlikeliest of all to join this ever-expanding rogue’s gallery of city characters, taxi driver Razmik. Razmik swiftly ushers us through the city, revealing sundry characters straight out of central casting, but via such honest portrayals (two frat guys drunk and nearly passed out who throw up in his car before being thrown out, an Instagram-model taking selfie after selfie, a rambling old man who hasn’t the faintest idea where he’s going, et al) that one might believe them to, once more, be unwitting background actors in the spy camera footage that has otherwise been so seamlessly intertwined into the rest of the film (all of whose actors, it should be added, are so incredibly authentic in their performances that it is impossible to detect who are newbie first-timer “non-actors” and who are seasoned pro’s, a similar touchstone of Killer of Sheep and a quality borne of the masterful acting direction of both Burnett and Baker). Though it’s true that the general audience and awards judges alike seemed to have largely missed the boat when Tangerine first came out in theaters, the film has thankfully since received its well-deserved due, courtesy the exponentially explosive recognition and career of its filmmaker. It appears “everyone” who had no idea such a movie as Tangerine existed (or, more to the point, just didn’t bother) was first in line to the release of Baker’s The Florida Project, which employed many of the same devices to create a similar sense of genuine reality (including an end sequence that indeed was straight-up “stolen,” location-permit-less “spy camera” footage) but, as well-crafted as it was, took an unsurprisingly cautious step backward from its once-in-a-career groundbreaking predecessor. The power of Baker’s ever-growing canon – be it in Tangerine now finding more of an audience, his short film “Snowbird,” The Florida Project and other musings written, directed and produced over the past few years – can be seen in his continued dedication and passion for exploring the worlds of travelers and modern-day (mis)-adventurers who often navigate their own tiny corner of the world to which they are consigned and have no sense of breaking out from aside from wild, arm-flailing and primal expression. In this way, Tangerine can be seen as an eternal flame brightening the short spate of American films produced in and around this time that spotlight similar characters and environs that today still continue to be otherwise elided, misrepresented or distorted: Jeremy Saulnier’s Blue Ruin and Green Room, David Mackenzie’s Hell or High Water, Robinson Devor’s Police Beat, Barry Jenkins’ Moonlight, Derek Cianfrance’s Blue Valentine and particularly in a selfsame manner of Tangerine, Collin Schiffli’s Animals and Andrea Arnold’s American Honey. Internationally, we can see a collective affinity for such characters, environs and brutally truthful filmmaking style via the likes of Iran’s Asghar Farhadi; Britain’s Michael Winterbottom; Ken Loach (most recently via I, Daniel Blake) and Paddy Considine (Tyrannosaur); Finland’s Aki Kaurismäki; Denmark’s Thomas Vinterberg; France’s Claire Denis; Israel’s Samuel Moaz and Turkey’s Deniz Gamze Ergüven (Mustang). It’s worth noting too the title of another (perhaps indirect) predecessor of Tangerine and Baker’s body of work: notorious (erstwhile) enfant terrible Harmony Korine’s “Act Da Fool” (a 2010 short film that, like Baker’s “Snowbird,” was in fact sponsored by a fashion company). The refreshing humor we see in Baker’s works, as with that of Killer of Sheep and Burnett’s subsequent projects, does stem in large part from the exploration of (what can be seen from the soi-disant “sophisticated” elite) as the procrustean “noble fool.” Think of the “sad clown” encapsulated by the literary archetypes of “Pierrot” or “Pagliacci,” hence references in both Killer of Sheep and Tangerine to goings-on of the as-often-sad-but-funny proscenium of Chaplin’s Tramp. The perspective of “the fool” can be funny/sad while very truthful. His is a perspective that is unfettered from any form of learned propriety, societal respectability and structured, bookish, didactic, institutionalized edification. It is a perspective of the true wanderer who learns via rough-and-tumble experience instead of, say, years of time-consuming, cloistered and out-of-reach-expensive graduate school studies. There is such an enviable purity and contrarian (dare I suggest first-wave punk rock?) societal disavowal and innocence to “the fool,” that filmmakers themselves throughout modern cinema history have taken on such a performative role in their cultivated personal branding and public image (e.g. Jean-Luc Godard, Andy Warhol, Woody Allen and Lars von Trier, who just this month brilliantly-stupidly-hilariously-sadly responded to New York Times critic Manohla Dargis’ question of whether or not his controversial The House that Jack Built was in fact a matter of his “trolling” women, by saying he didn’t know what the word means). The notion of “acting da fool” explicitly suggests the idea of performance (“acting”), which can be a kind of veneer or possible shield for such seemingly “idiotic” provocation (and therefore easily ignorable and thus innocuous to those in power too bureaucratically busied by more sophisticated concerns). It has been speculated that this may in fact be the case as regards the recent antics (???) of Kanye West (who, among other things that certainly require no rehashing here, recently released a song called “Lift Yourself” that includes lyrics about “poop”). These performances, both onscreen and off, are akin to those of arguably modern America’s most vital truth-teller, Richard Pryor, who continued to play with his onscreen and meta performance as “the fool” from the time of his devastating childhood that ceased his formal schooling at grade eight, all the way through his tempestuous and notable career. It’s not so much that Pryor’s life was filled with equal parts humor and sadness, triumphs, tragedy and desperation silver-lined with jouissance. It’s that this complicated, nuanced life of Pryor’s was so nakedly revealed to the public, whether he was prancing around for a buck in films he himself often maligned in interviews; engaging in highly publicized industry in-fighting with agents, managers, colleagues, co-stars and studios/networks (read: the majestic disaster that was NBC’s The Richard Pryor Show); or, most crucially of course, laying himself totally bare through his purest outlet, the stand-up comedy show, which those of us unlucky enough not to have been there to witness in person have at least a shimmer of that flaming, incandescent light via recorded specials, most notably 1979’s Live in Concert. Boom for real. This exact summation could be used to describe Tangerine or, for that matter, nearly every other film in my series. In telling us the deepest, darkest, most painful and somehow uproariously funny truths of his life, the life of others in his underrepresented and/or disenfranchised “on the fringe” community (throughout the nation, perhaps even the world at large over the course of his decades of travel) through his singular (often bleary-eyed) angle, Pryor – with works such as Live in Concert – granted us all a brutally raw view so unvarnished that it can only be experienced by mainstream audiences as that coming from the humor and tragedy of “the fool” who in the end was, as Saul himself writes throughout his exhaustive 500-page biography of Pryor, a “trickster” whose final (if not only) joke was on us. As I finished the movie, I realized I may have been right, that Baker’s vision – that of Pryor’s, Chaplin’s, Robert Flaherty’s, Burnett’s, Tolstoy’s, Dostoyevsky’s and Ellison’s before him – is that of those unfortunately few working throughout the country and across the globe today who may appear to be easily ignored as telling stories of the undereducated, the naïve, the oblivious, the unsophisticated, the isolated a la Diogenes the Cynic’s “cosmopolitanism,” the lone pioneer brave and “stupid, silly and/or crazy” enough to go out beyond where anyone else has gone in order to tell the rest of us where we’re going or should go (remembering the true definition of “avant-garde” or vanguard here) …while being nonetheless the most prescient for those of us willing to watch, listen and at least attempt to understand through laughter, tears and revelation alike.